If you’re planning to build a gym at home, consider getting a good set of dumbbells. They are one of the most versatile free weights that allow you to do multiple types of exercises. To help you find the best dumbbell set that won’t hurt your budget, we’ll review five popular brands that are highly revered by customers. A set of dumbbells may take too much space in your home gym but believe us, you’ll save more money than buying the pieces individually. Although the cheaper sets may not be highly laden with features, they’re still good enough for weight training. What must I look for when buying a dumbbell set? The most convenient dumbbells by far are the fixed dumbbells that allow you to pick up a pair and begin exercising right away. The weight of these dumbbells is set at a constant number. Typically, the lightest models may start at 1/4 kilogram, 1/2 kilogram, and 1 kilogram, after which the weight increases incrementally by one kilogram. However, you need to consider the cost of owning them. Using this type of dumbbells means you’ll need a lot of pieces to lift heavier weights. It would also be very burdensome if you need to move them to another area. To keep your dumbbells organized, consider getting a rack. The adjustable dumbbells are a smarter choice as you can adjust the weight to suit your specific exercise needs. Unlike a fixed dumbbell which is a single solid piece, an adjustable model is composed of three parts: weight plates, bar, and a lock to secure the plates. Although you can save space in your home gym, you may not be able to proceed to another exercise smoothly without tweaking the weights first. Purchasing a full set of dumbbells is possibly a cheaper way of creating a sound home gym. In comparison to some bulkier equipment, dumbbell sets allow you to arrange your living area efficiently. Even if they’re smaller than barbell﻿﻿s, they can be used by either advanced or novice lifters to gain mass and tone up, respectively. Learn how to use dumbbells in your back workout in this video. According to American Council Of Exercise (ACE), dumbbell training can result in muscle growth by stimulating the repair process of damaged ﻿﻿muscle﻿﻿s and allowing your muscles to store more glycogen. Dumbbell training can also lead to better muscle activation by creating excellent muscular coordination. Best of all, it gradually increases body strength and metabolic rate. Dumbbells may come in different styles, but the dumbbells that we reviewed are either shaped as hex or York contoured hex. If you want dumbbells that don’t roll out of place on the rack or roll under your feet when you put them on the ground, choose the hex style. This style has six sides to keep it in place. A York contoured hex has a handle that’s designed with a thicker contour in the middle. Although it aims to provide a more ergonomic grip that’s perfect for arthritic hands, it seems to be uncomfortable for some people. Dumbbells are constructed of cast iron, but most manufacturers conceal the iron with other materials to enhance their feel and appearance. The most common materials used are neoprene and vinyl. Neoprene is a better choice because it has water-resistant properties which make it not slippery even if your hands get sweaty. To save you the money of buying a rack separately, look for a fixed dumbbell set that already offers this kind of accessory. The stand will help store your dumbbells properly and keep your workout space tidy. For adjustable dumbbell sets, look for a case to store your weight plates and other parts more properly. To perform more exercises, look for a dumbbell set that offers a wide range of weights. A fixed dumbbell set can offer as much as three pairs of weights. Meanwhile, an adjustable dumbbell may offer more variety with its high number of weight plates. The j/fit Dumbbells Set includes three pairs of fixed dumbbells: two 3-pounds, two 5-pounds, and two 8-pounds. The neoprene coating resists degradation and won’t scratch off easily. 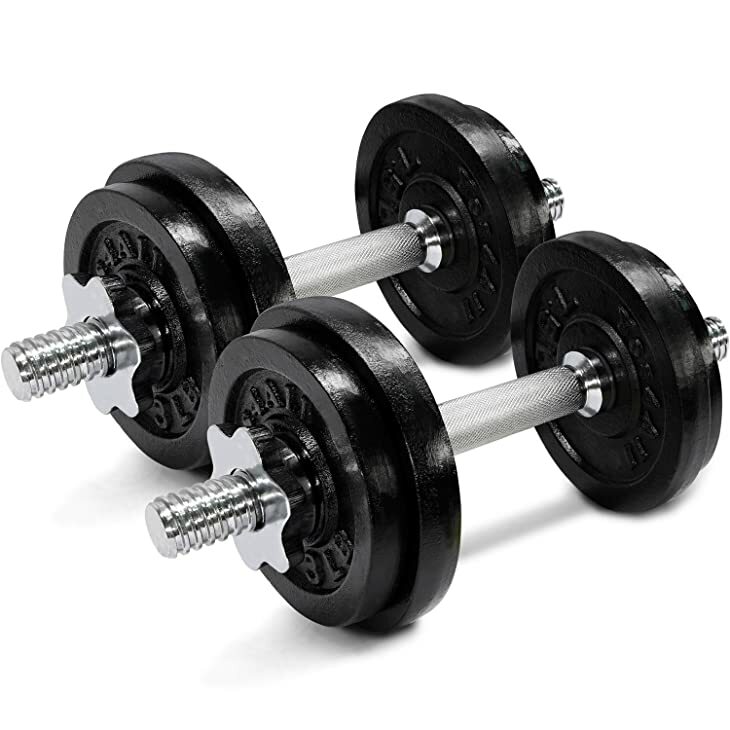 The iron steel beneath gives the dumbbells durability to last for a very long time. The handles are comfortable and don’t slip even if they get wet with your sweaty hands. 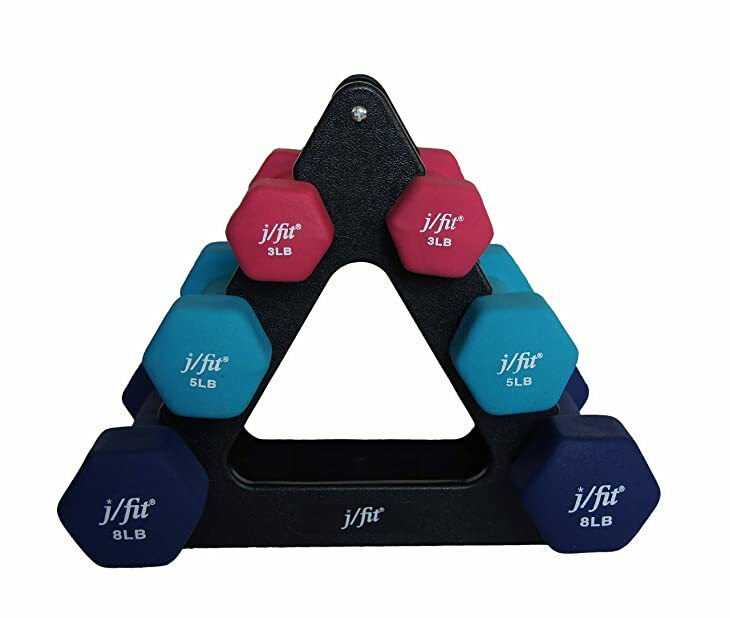 To keep your dumbbells in order, j/fit includes a durable rack. Proving its reliability, j/fit offers a 5-year warranty. The handle offers a secure grip even if your hands get sweaty. The dumbbells may collect dust easily. 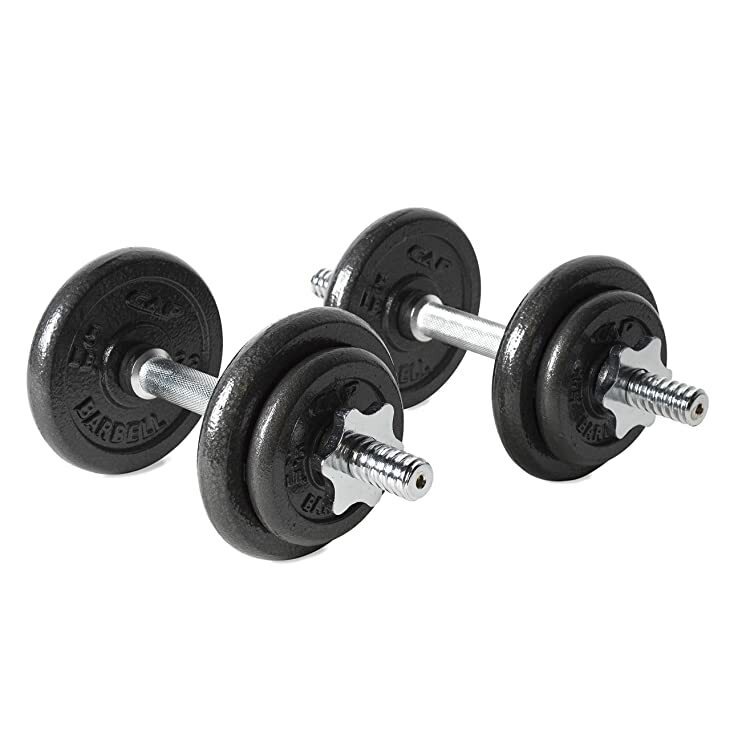 The AmazonBasics Dumbbell Set consists of three pairs of fixed dumbbells in weights of 2 pounds, 3 pounds, and 5 pounds. Each pair is color coordinated to help set them apart from each other. You can perfectly use the dumbbells for resistance training and other arrays of exercises. 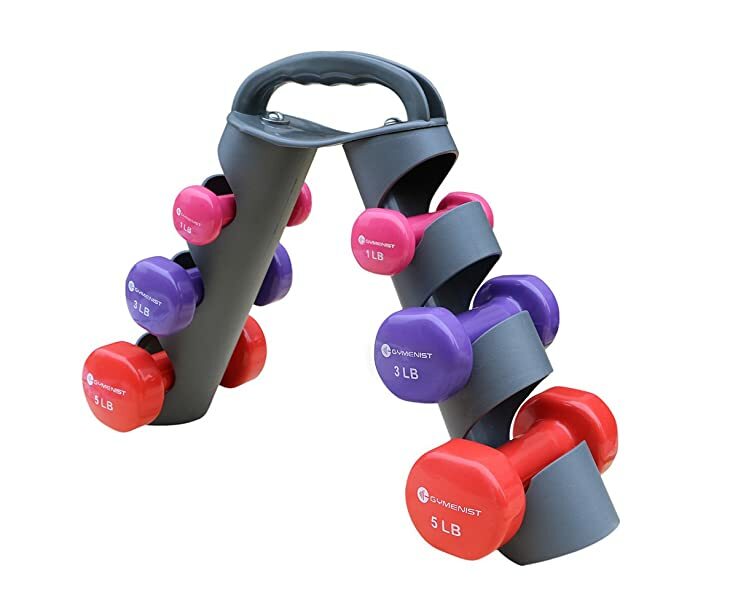 The dumbbells include a stand that you can easily assemble. The neoprene coating gives a secure grip even if your hands get sweaty. The rubber-like covering also protects your floors and make the dumbbells amenable for outdoor use. The CAP Barbell Adjustable Dumbbell Set has a total of 40 pounds of weight, including two handles, four 5-pound plates, four 2.5-pound plates, and a carrying case for storage. The handles are ergonomically designed to give a secure grip. The collars are threaded to give a locked fit to handles. The carrying case is made of heavy-duty plastic for durability and a carrying handle for portability. The plates are made of cast iron and treated with a semi-gloss finish to resist rust. Every dumbbell is knurled to ensure a secure and steady grip. The collars are threaded to give a good fit. The Yes4All Adjustable Dumbbells is a set of two dumbbells with adjustable plates reaching to 50 pounds. The whole set includes two handles, four 3-pound plates, four 7.5-pound plates, and four collars. The cast iron weight plates can accommodate all standard 1-inch standard bar. The black paint finish prevents the handles from getting rust and corrosion. To give a firm and non-slip grip, the chrome handles are knurled. The dumbbells are perfect for doing several exercises, like core fitness, strength, and heavy leg lifts. The GYMENIST Dumbbell Set comes with three pairs of fixed dumbbells: 1-pound, 3-pound, and 5-pound. The vinyl coating gives a comfortable grip and goes easy on the floors when dropped. Best of all, it comes with a rack that can be folded for travel. The handles are built to fit in your palm comfortably plus they are not slippery. Each pair is color coded to make it easy for you to identify each weight. The dumbbells are perfect for cardio or any types of workout that need light weights. So the winner is the j/fit Dumbbells Set With Durable Rack because it has most of the features that we’re looking for. 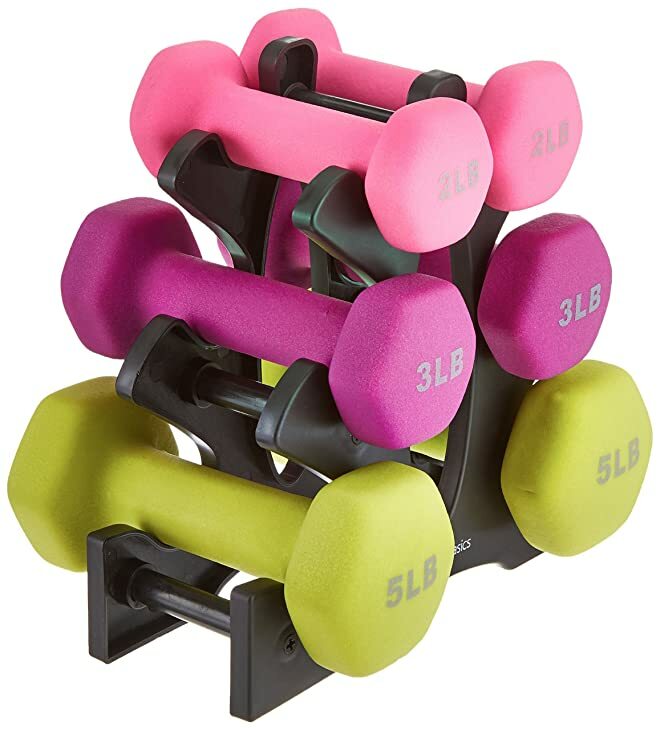 The j/fit dumbbell set includes 3 pairs of dumbbells and a rack. The dumbbells are covered with a neoprene material that won’t chip off easily and hexagonal heads to keep from rolling away. Best of all, it comes with a 5-year warranty. If you have any questions or suggestions, let us know about it in the comments section. Please share this article if you like it.